In honor of our participation in Health Hack Day (@healthhackday) in Stockholm later this week (watch this space for slides and more details), I’d like to feature some European Health Graph (@healthgraphapi) partners over the next couple of weeks. This time, let’s look at how one of our newest strength training partners, Berlin-based Gym Hero (@gymheroapp), is using a streamlined approach to workout tracking coupled with the Health Graph to help people improve their fitness. Gym Hero: We are Jannik and Jannis, the founders of Big Mike Alright, the small but nice company behind Gym Hero. Gym Hero is currently a side project we are working on in addition to our day jobs and college. We both love sports but are especially addicted to kitesurfing! Gym Hero is a gym workout tracking app that learns from you while staying out of your way as much as possible. The user interface is streamlined and optimized to be used while you work out, even with shaky hands. Workout routines are automatically learned as you go, so you never have to enter a weight or name twice. You are free to name your workouts and exercises however you like – full flexibility instead of endless searching and browsing in predefined, fixed lists. Each of your workouts gets its own webpage (if you want) with all the details, so you can share, compare and discuss with friends. We both have been using Runkeeper tracking for our cardio activities for quite some time now. Being data and statistics junkies, our weight goes into the Health Graph via a Withings scale, and our blood pressure is monitored and sent to the Health Graph via a Withings blood pressure monitor. We track our runs and the bicycle commute to work with RunKeeper. 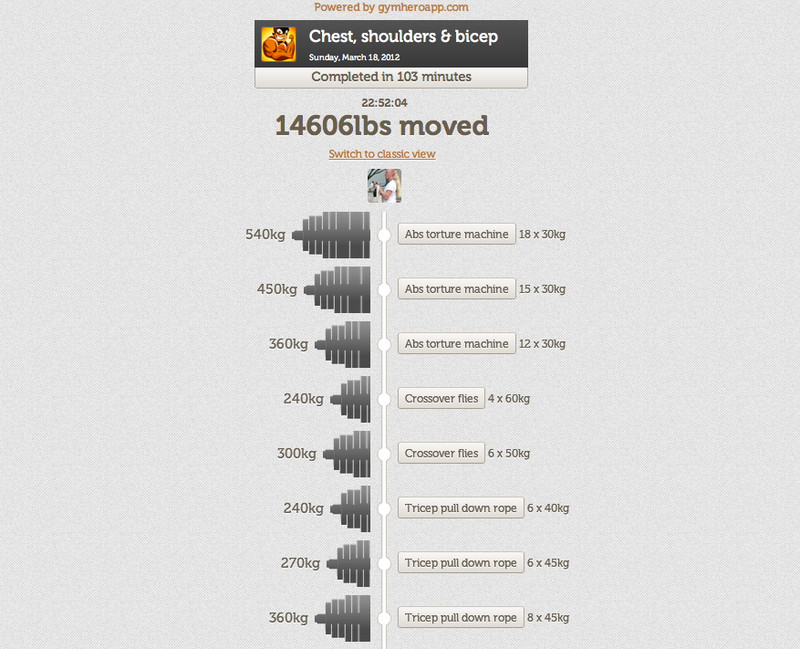 Because we also love to work out we wanted to add our gym workouts to our Runkeeper profile as well. When we heard about the Health Graph API we wanted to join. Quantify yourself! BD: How is using the Health Graph benefiting Gym Hero and your users? The Health Graph community is a place where sports enthusiasts of all types meet to motivate each other, exchange, discuss and most of all track and measure their performance. It’s a great place to collect all your sports and health related data. So obviously, we wanted to allow our community to join the Health Graph family and vice versa. And for the programmers reading this: The Health Graph really is easy to use and embed into your applications. Go try it out! Since Gym Hero focuses on doing one thing only, but doing it really well, we use the strength training portion of the Health Graph API. We feed full workouts including workout notes and exercise names into the Health Graph. We don’t track cardio or time based training (yet). We love the idea behind the Health Graph. Bringing together such a great variety of health data is simply awesome. On top of that it’s a breeze to integrate into other applications. Just keep up the great work! We would like to see a little more flexibility when it comes to defining muscle groups for each exercise. Our basic idea for Gym Hero is to give our users full freedom in naming their exercises/workouts. We would love for this to also be possible for muscle grouping. We’ve been updating every five to six weeks with new features and improvements, but there are a lot of updates still to come. We will extend the workout summary view for a better performance check, add data sync with iCloud and a workout timer to name only a few upcoming features. Our users can also request and vote for new features. They can do this by clicking on the speech bubble in the app or by going here. Please help us build the finest workout app ever by making your requests. We love to hear from our users! If you want to track your gym activities and are looking for a slick app which is not blown up with useless stuff check out Gym Hero. Never leave without flexing!